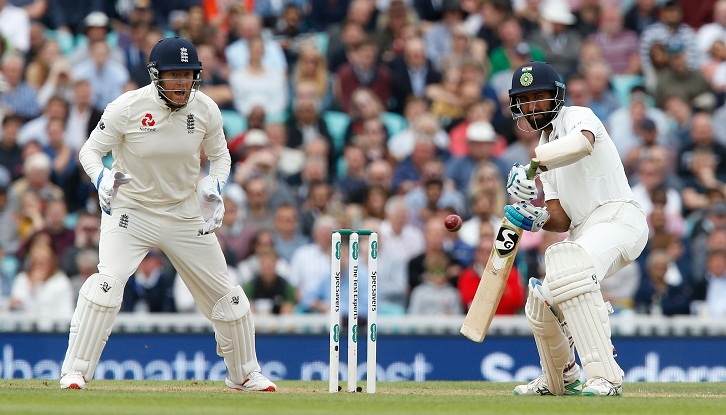 India were 53 for one in reply to England's first innings 332 all out, a deficit of 279 runs, at tea on the second day of the fifth Test at the Oval on Saturday. KL Rahul was 35 not out and Cheteshwar Pujara 15 not out. Stuart Broad struck with his first ball to have Shikhar Dhawan lbw for three. Earlier, England scored over a hundred in Saturday's morning session after resuming in trouble on their overnight 198 for seven. Jos Buttler, on his 28th birthday, made 89 -- the fourth time in England's last five Test innings he has been the top-scorer -- before he was last man out, caught at slip off Ravindra Jadeja. Left-arm spinner Jadeja, playing his first match this series, led India's attack with four wickets for 79 runs in 30 overs. England lead this five-match contest 3-1.